Today's image is was a 'quick & dirty' set up shot used as an illustration at a recent phantogram workshop in Thousand Oaks. 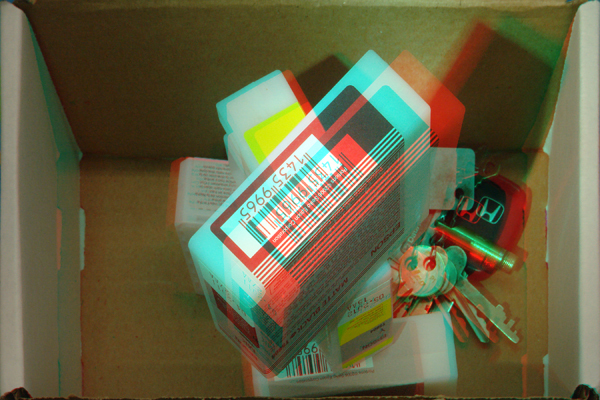 Into a white cardboard box I placed a few Epson 3800 ink cartridges, and as an after thought tossed in my keys. The top of the box was used as the phantogram's "target grid". This set up was intended to show how a phantogram can both sink down into the page and dramatically rise up out. This image is a phantogram, so I invite you to print it out so you can see it back from an angle.